Any bug please post here! Download only one! if you not using the first person animation download the "Morita 5.56" file, if you using the first person animation use" Morita 5.56 Custom Animation". Credits go to Davis237834 he creates the original mod. shame the animations dont work in PA.
only thing i would add is the Powerful Armor piercing reciver as it lacks punch at higher levels and the only way to go there is armor piercing when going command build. P.S good job getting the weapon to accept a new ammo type without breaking the custom animation i failed when i tried to. 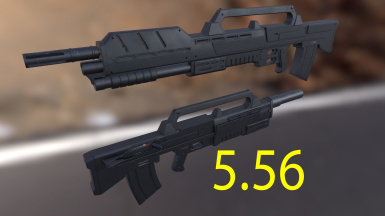 Yeah i wish to improve the rifle but i am not the original modder and i don't know how to create mods in this "professional" level. my skills is only basic. About your attempt to change the caliber, i have to say that i did by modifying the "original" .ESP from the custom animation. Do you want to know more? Join the Federation today!